Purpura annularis telangiectoides is a rare form of pigmented purpuric dermatoses which usually presents as annular patches with central clearing on the lower extremities. 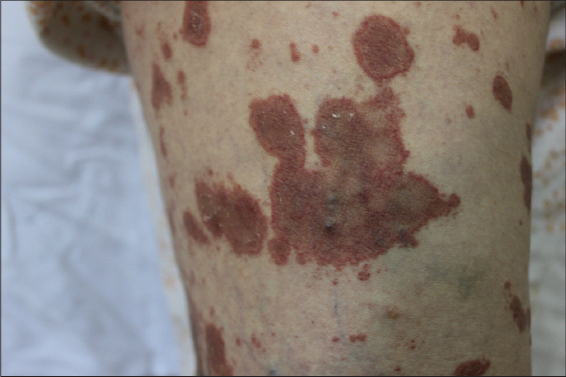 We present an atypical presentation of purpura annularis telangiectoides with generalized lesions in an elderly woman. Pigmented purpuric dermatoses (PPD) are a group of chronic, progressive vascular disorders which are resistant to treatment . Purpura annularis telangiectoides (PAT) is an uncommon PPD which is also known as Majocchi disease [2,3]. It is usually seen in adolescents and young adults and characterized by non-palpable annular patches on the lower extremities2. Herein we present an atypical case of generalized PAT in an elderly woman patient. 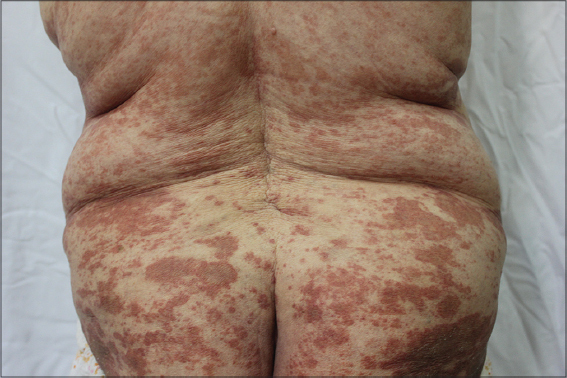 An 88-year old women presented with a pruritic eruption which had started 5 months ago. She had hypertention and congestive heart failure and had been using acetylsalycilic acid, metoprolol and losartan potassium therapies for 10 years. Her past medical story was otherwise nonspecific. Dermatological examination revealed multiple red-brown annular patches with central clearing on both of the extremities and trunk (Figs 1 and 2). Laboratory examinations including complete blood count, routine biochemistry, coagulation parameters, urinanalysis were normal. Punch biopsy from the lesions showed perivascular lymphocyte infiltration in the papillary dermis and extravasated red blood cells (Fig 3). The patient was diagnosed as PAT and treatment with topical corticosteroid and antihistaminic was started, the lesions showed moderate regression after 15 days. Figure 1: Multiple annular patches the trunk. Figure 2: Annular patches with cenral clearing on the lower extremities. 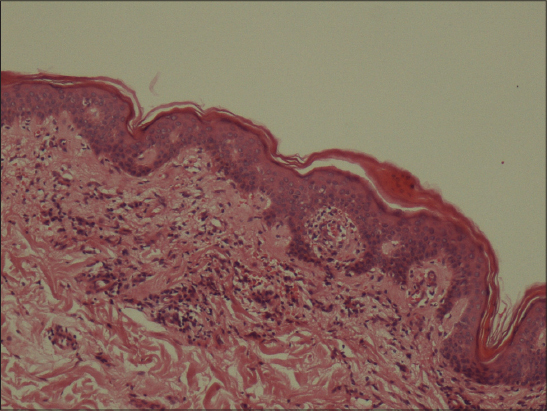 Figure 3: Perivascular lymphocyte infiltration in the papillary dermis and extravasated red blood cells (H&Ex100). PPD are a group of disorders characterized by petechial and pigmentery macules on the lower extremities [1,3]. They are histologically similar and are primarily differentiated on the basis of morphology . PPD include; progressive pigmented purpuric dermatosis, PAT, lichen aureus, pigmented purpuric lichenoid dermatosis and eczematid-like purpura of Doucas and Kapetanakis [1,3]. PAT is a rare form of PPD which was first described in 1896 by Domenico Majocchi . It is usually observed in female adolescents symetrically on the lower extremities . Punctate telangiectatic and purpuric macules progress to annular patches with central clearing and infrequently atrophy [2,4,6]. The lesions are mostly annular but stellate, serpiginous and linear forms have been described . Pruritus is usually not observed . The etiology is unknown, but venous hypertention, exercise, gravitational dependence, capillary fragility, focal infections, contact allergens, medications and alcohol ingestion have been suggested in the pathogenesis [1,3]. Histopathologically superficial papillary dermal capillary dilatation, perivascular lymhocytic infiltration and erytrocyte extravasation are observed . The differential diagnosis of PAT includes leukocytoclastic vasculitis, erythema annulare centrifigum, subacute lupus erythematosus, stasis dermatitis, mycosis fungoides, trombocytopenia and coagulation disorders . Though there is no medication of proven benefit, topical and oral corticosteroids, antihistamines, pentoxyphylline, psoralen-ultraviolet-A and narrowband ultraviolet-B have been used in the treatment [1,3,5]. We presented our case as generalized lesions in an elderly women is a very rare and atypical presentation of PAT. We would like to remind that the differential diagnosis of PAT should be considered in patients with annular erythematous eruptions. 1. Sharma L, Gupta S, Clinicoepidemiological study of pigmented purpuric dermatosesIndian Dermatol Online J 2012; 3: 17-20. 2. Hale EK, Purpura annularis telangiectodes of MajocchiDermatol Online J 2003; 9: 17. 3. Sardana K, Sarkar R, Sehgal VN, Pigmented purpuric dermatoses: an overviewInt J Dermatol 2004; 43: 482-8. 4. Hoesly FJ, Huerter CJ, Shehan JM, Purpura annularis telangiectodes of Majocchi: case report and review of the literatureInt J Dermatol 2009; 48: 1129-33. 5. Wang A, Shuja F, Chan A, Wasko C, Unilateral purpura annularis telangiectodes of majocchi in an elderly male: an atypical presentationDermatol Online J 2013; 19: 19263. 6. Kaplan R, Meehan SA, Leger M, A case of isotretinoin-induced purpura annularis telangiectodes of Majocchi and review of substance-induced pigmented purpuric dermatosisJAMA Dermatol 2014; 150: 182-4.